The Other World Society, an international ghost and apparition research group, is dedicated to exploring all post-death phenomena. This site contains information on the séance, the Ouija board, necromancy, spiritism, ghosts and apparitions, ghost hunting, and paranormal research. The Other World Society is sponsored by Shawnee State University (USA). 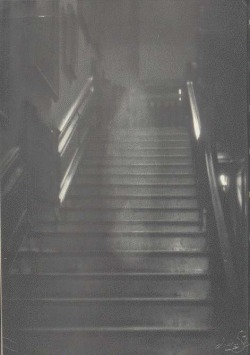 Photographed in 1936, this is supposed to be the ghost of Lady Dorothy Walpole Townsend, the second wife of Marquis Charles Townsend. Her husband, after discovering that she had been the mistress of Lord Wharton, locked her in Raynham Hall. She died in 1726, of unknown causes.